You are going think I am making this up, but local communities in Britain are outraged by budget cuts which may eradicate Lollipop people. It’s not a joke; it just sounds like one. 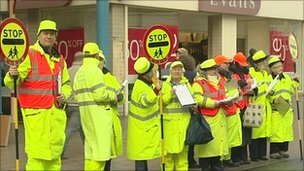 You see, Lollipop people are legitimate contributors to our society. Because they are actually crossing guards. Dorset County community members have started a blog to raise awareness. The BBC is reporting on action taken in Lowestoft. The Independent is ringing this bell, too.